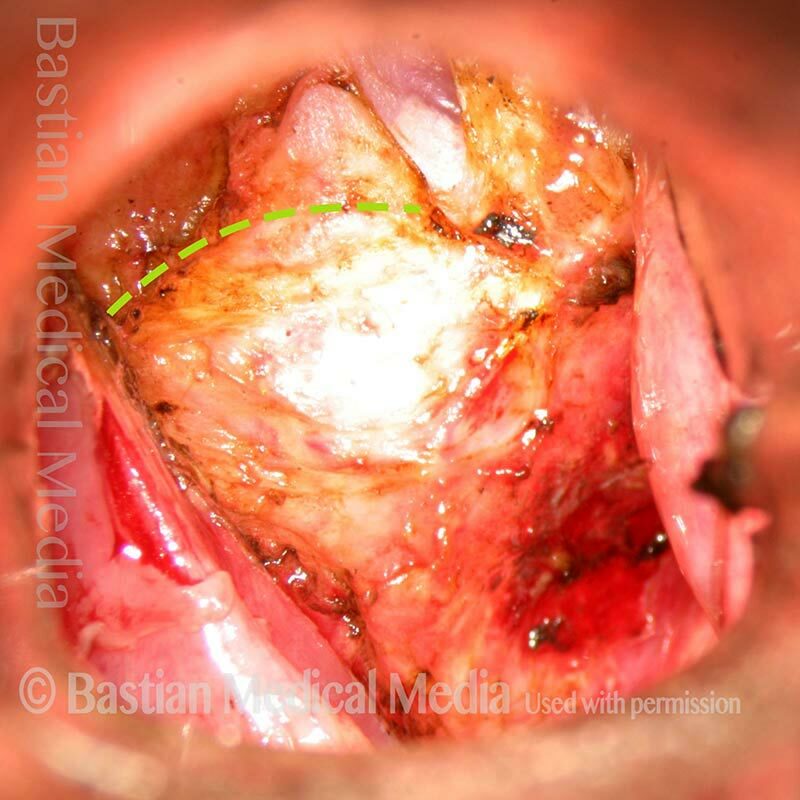 A closed sac originating from a formerly open and functioning laryngeal saccule. An analogy for a saccular cyst is a velvet bag used to hold coins which has its opening cinched shut by a drawstring. The mouth of the saccule becomes blocked, and mucus secreted within the saccule cannot escape through the normal opening in the anterior ventricle. 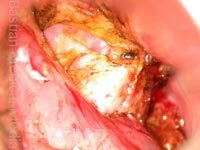 This closed sac gradually expands, causing the false cord and aryepiglottic cord to bulge; the sac can further expand over the top of the thyroid cartilage and into the neck. 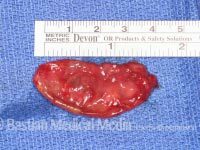 Saccular cyst on the left was removed ~ 20 years ago. 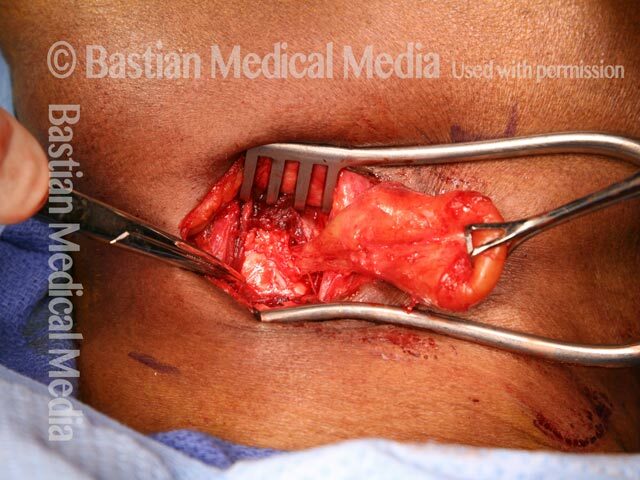 In this panoramic view, notice that the left false cord is surgically absent. Voice is normal during this view of phonation. 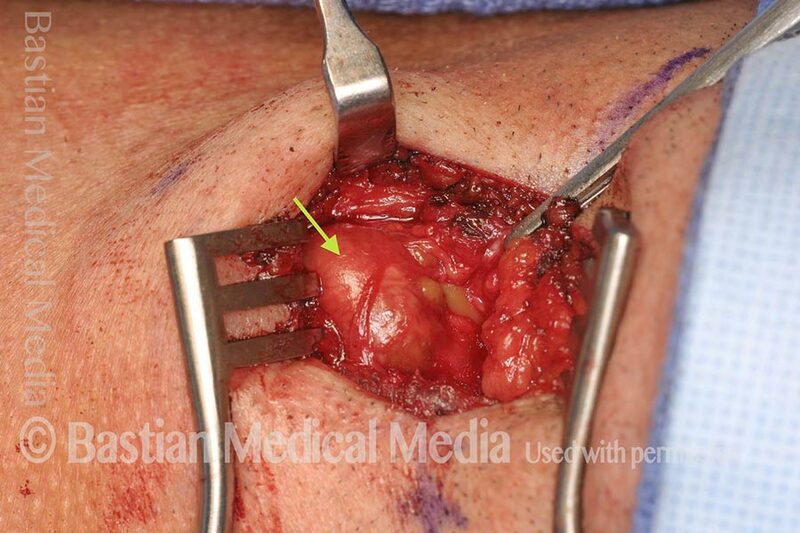 Dotted line indicates the outline of the original cyst, as much was delivered from within the aryepiglottic cord. A closer view during respiration. Spherical submucosal mass fills the left supraglottis (right of photo) and bulges into the medial left pyriform sinus, best seen using a “trumpet maneuver”. 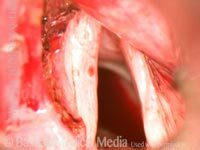 Close range endoscopy shows that although the mass obscures the left true vocal cord (right of photo), it is clearly separate. On preoperative CT, the homogeneous, smoothly-marginated mass pushes superiorly into the preepiglottic space. 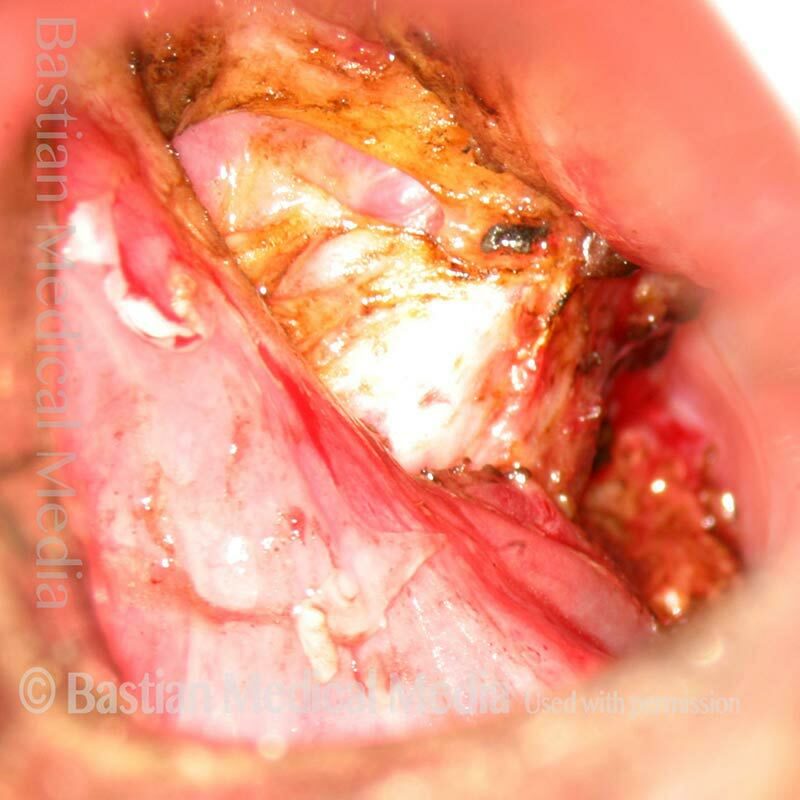 Two months after endoscopic transoral laser resection. 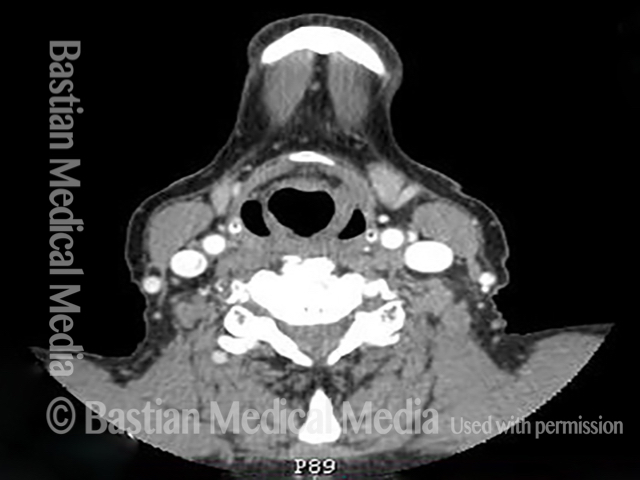 The normal contours of the supraglottis and medial pyriform have been restored, and the left vocal cord (right of photo) is now fully visible. Her voice has returned to normal. 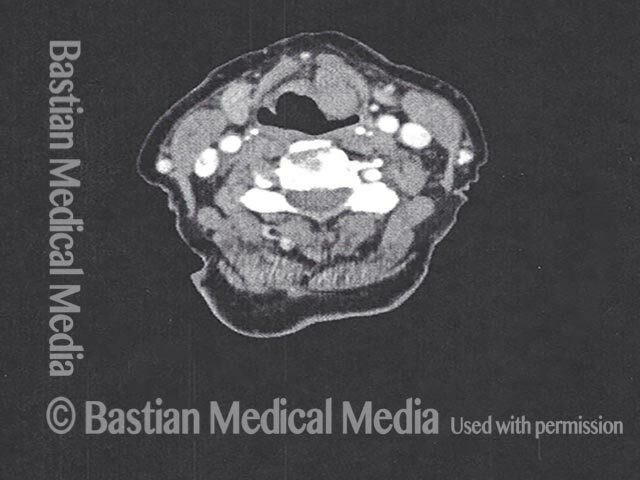 3 month postoperative CT shows complete excision of mass. 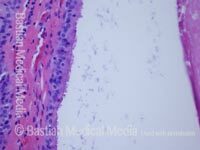 Saccular cyst with extensive oncocytic metaplasia. 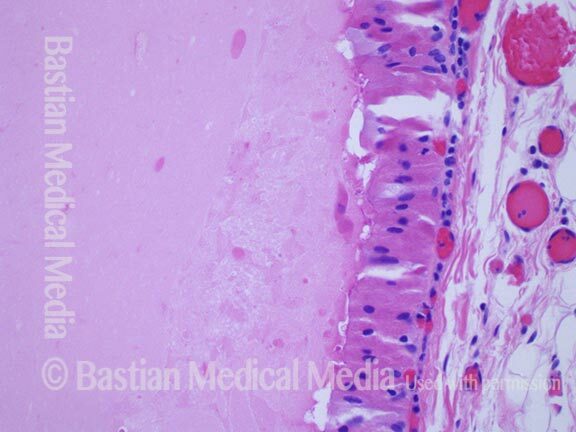 Note the presence of both respiratory ciliated mucosa and granular oncocytic cells in the cyst lining. 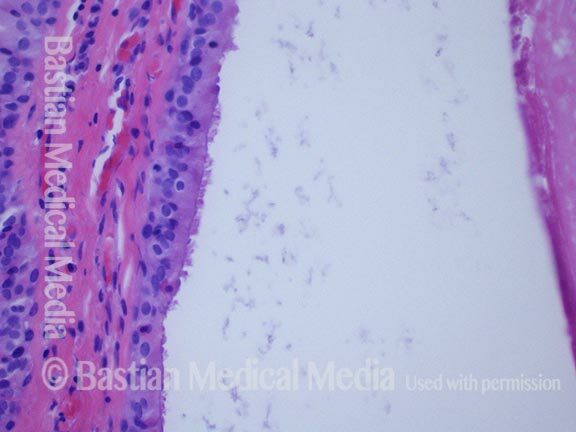 Portion of the cyst, lined by oncocytes. During an upper respiratory infection, this older woman developed hoarseness that has not gone away during the past year. Is this the end stage perhaps of a hemorrhagic polyp? 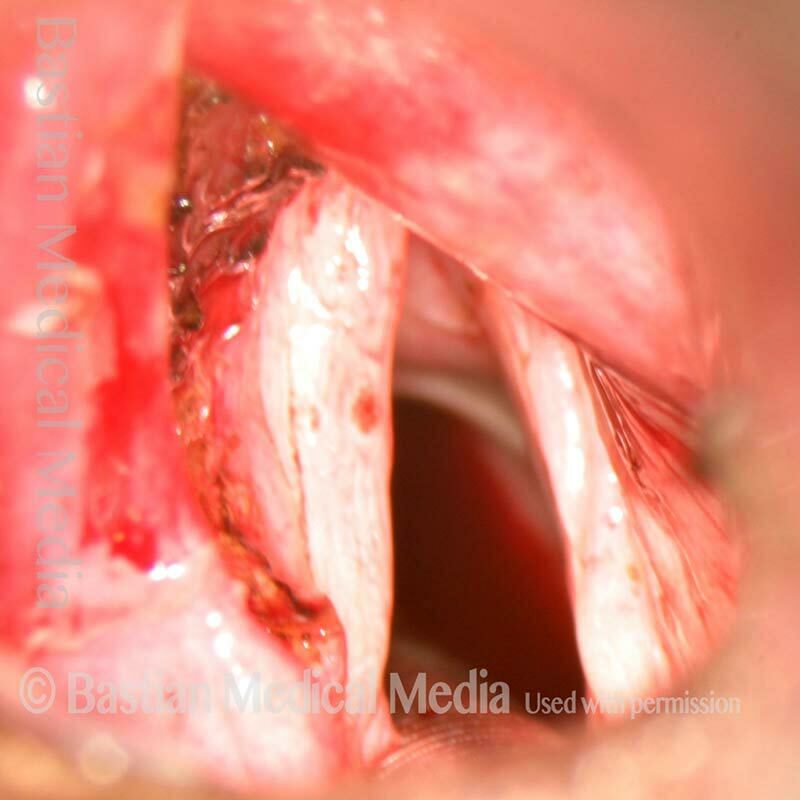 In this slightly closer view, with the patient breathing out, the lesion appears too “high” within the laryngeal vestibule, and not truly at the level of the vocal cords. The tip of the scope has just passed the lesion and the vocal cords are unaffected. 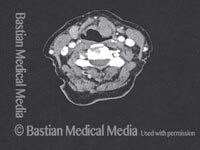 As it appears to be arising from the ventricle, it could be classified as an anterior saccular cyst. Likely the saccule or a mucus gland became plugged due to inflammation during the upper respiratory infection a year earlier, and it filled with mucus. An experienced R & B singer has begun to experience loss of clarity and a “paper rattling” sound especially upper range. Are the bilateral saccular cysts (arrows) the explanation? Let’s look closer. At closer range and higher pitch of G4 (392 Hz) produced with light falsetto, now we can also see bilateral margin swellings and a tiny capillary “dot.” Is this the explanation? Let's look further. Now using pressed chest voice more typical of the patient’s singing style at E4 (330 Hz), the saccular cysts come into greater contact and considerable mucus begins to form. Detailed review at the same pitch reveals that the rattling sound comes from a combination of vibratory participation of the saccular cysts, and a “boiling” sympathetic vibration of the mucus. 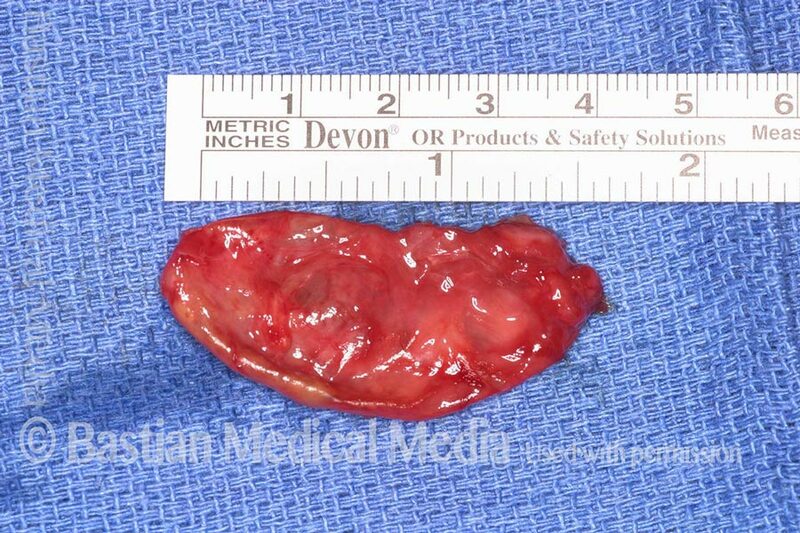 If hydration, and a brief reflux trial do not help, the cysts will be removed. This man was examined elsewhere for another reason and sent for evaluation of “polyps” in his larynx. Notice the anterior saccular cysts protruding from the anterior ventricle and false cord margin bilaterally (see arrows). He considers his voice to be normal. At closer range, asterisks mark each cyst. During voice making, notice that neither cyst presses downwards on the vocal cords. That is why voice is normal. 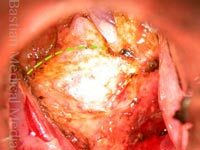 Cysts of this sort, diagnosed by intense visual criteria, can be followed once or twice at long intervals, and only occasionally need to be removed due to voice disturbance.